Conures are a diverse, loosely-defined group of small to medium-sized parrots. They belong to several genera within a long-tailed group of the New World Parrot subfamily Arinae. The term "conure" is used primarily in bird keeping, though it has appeared in some scientific journals. The American Ornithologists' Union uses the generic term "parakeet" for all species termed conure elsewhere, although Joseph Forshaw, a prominent Australian ornithologist, uses the term "conure". Conures are either large parakeets or small parrots that are found in the western hemisphere. They are analogous in size and way of life to the Old World's Rose-ringed Parakeets or the Australian parakeets. All living conure species are found in Central and South America; the extinct Conuropsis carolinensis or Carolina Parakeet was an exception. Conures are often called the clowns of the parrot world due to their constant attention seeking behavior including hanging upside-down and swaying back and forth or "dancing." Conures are as diverse a group as African Parrots, so trying to characterize them all is difficult and inaccurate. 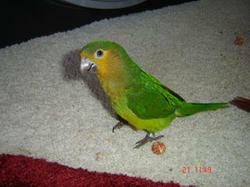 The category conure is loosely-defined because they do not currently constitute a natural, scientific grouping. 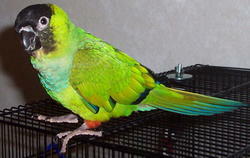 The term conure is now used mostly in aviculture. Scientists tend to refer to these birds as "parrots" or "parakeets." They are known as clowns of the parrot species because of their antics and the way they behave.